This article is part of our Information about information project, run in collaboration with FQXi.Click here to read other articles related to John Wheeler's concept of "it from bit". If a tree falls in the woods and no one is there to hear it, does it make a sound? Do things only exist if they are perceived? What does physics tell us about reality? These are some of the greatest questions in physics and philosophy, still unanswered after decades, or even centuries, of debate. Some wonder if they can ever be answered, but one physicist was unafraid to try: John Archibald Wheeler. Wheeler (1911-2008) is a legendary figure in physics. He worked with Niels Bohr to explain nuclear fission, worked on the hydrogen bomb at Los Alamos, and taught many eminent physicists including Richard Feynman, Kip Thorne and Hugh Everett. He was the father of modern general relativity, was key in developing our understanding of black holes and, indeed, popularised the term "black hole" (after it was suggested to him by an audience member at a conference) and coined many others, including "worm hole" and "quantum foam". "It from bit symbolises the idea that every item of the physical world has at bottom — at a very deep bottom, in most instances — an immaterial source and explanation; that what we call reality arises in the last analysis from the posing of yes-no questions and the registering of equipment-evoked responses; in short, that all things physical are information-theoretic in origin and this is a participatory universe." Wheeler's "it from bit" concept implies that physics, particularly quantum physics, isn't really about reality, but just our best description of what we observe. There is no "quantum world", just the best description we have of how things will appear to us. As Niels Bohr, one of the founders of quantum theory, said:"It is wrong to think that the task of physics is to find out how Nature is. Physics concerns what we can say about Nature." Anton Zeilinger is Professor of Physics at the University of Vienna. Image: Jaqueline Godany. 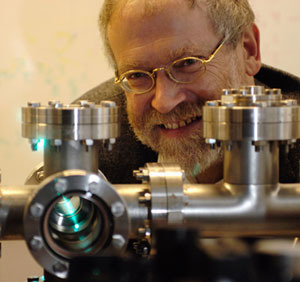 Anton Zeilinger, Director of the Institue for Quantum Optics and Quantum Information, explains: "My interpretation [of "it from bit"] is that in order to define reality, one has to take into account the role of information: mainly the fact that whatever we do in science is based on information which we receive by whatever means." But can we go one step further? Can we say reality is information, that they are one and the same? Zeilinger thinks not: "No, we [need] both concepts. But the distinction between the two is very difficult on a rigorous basis, and maybe that tells us something." Instead, we need to think of reality and information together, with one influencing the other, both remaining consistent with each other. Perhaps the answer will follow Einstein's great insight from one century ago when he showed that you can't make a distinction between space and time, instead they are instances of a broader concept: spacetime. In a similar way, perhaps we need a new concept that encompasses both reality and information, rather than focusing on distinguishing between them. One clear consequence of "it from bit" is the importance of the observer: reality requires one. "I think [Wheeler] was very radical," says Zeilinger. "He talks about the participatory universe, where the observer is not only passive, but the observer in certain situations makes reality happen." But Wheeler went further than saying we can only describe reality via our observations. "It's more than that," says Zeilinger. "He would have said that there is no reality beyond what can at least be observed. I don't know whether it's true or not but I like the radicality of this approach." This idea may be radical but it is not new in philosophy. As far back as 1710, the philosopher George Berkeley wrote "to be means to be perceived". "I don't know whether Wheeler would have gone that far," says Zeilinger. Instead he thinks that Wheeler believed that carefully analysing what information is, and what it means, can teach us about reality. 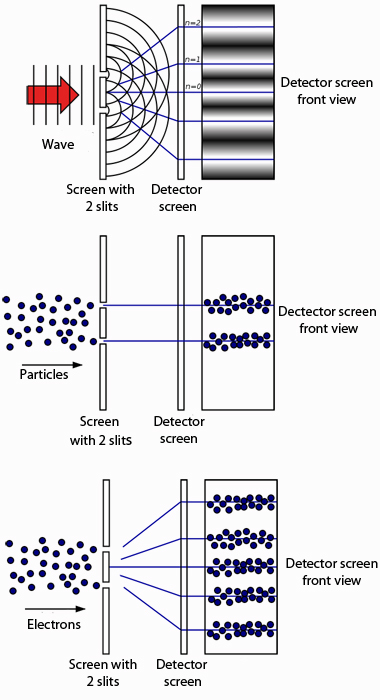 The double slit experiment: The top picture shows the interference pattern created by waves passing though the slits, the middle picture shows what you'd expect to see when particles are fired through the slits, and the bottom picture shows what actually happens when you fire particles such as electrons through the slits: you get the interference pattern you expect from waves, but the electrons are registered as arriving as particles. Wheeler's conjecture of "it from bit" has been very important in the development of modern ideas about the role of information in quantum mechanics. It has given theorists, philosophers and experimentalists new avenues to explore questions that have challenged quantum physicists for decades. The role of the observer is already an area of debate in quantum physics. (You can read more here.) And a participatory universe brings up even more questions, for example: What is an observer? Most physicists agree that an observer doesn't have to be human, or even conscious. Measurement and observations happen in inanimate apparatus: for example, photographic film registers the presence of a photon. But if observations do make reality happen, why do our many observations all agree on one version of the Universe? If Wheeler is correct and reality is based on answers to yes or no questions, then understanding how these measurements come about is very important. But what is a measurement? This is a straightforward question in classical physics: it is the registering, using some sort of equipment, of what is happening in physical space. The question "Is the object located at point x, yes or no?" has an answer regardless of any observation. But in quantum physics, as we saw above for the example of the quantum particle in a box, measurement is problematic. What happens when we make a measurement, and what constitutes a measurement, is a question that is still open to debate. But Wheeler suggests that it doesn't make sense to talk of reality before the measurement is made: "The past has no evidence except which is recorded in the present." For example, in the double-slit experiment, whether the standard version or Wheeler's delayed choice experiment, a photon will act as a wave or a particle depending on how you decide to measure it. It doesn't make sense to ask what state it was in before you made the measurement. And it is not just the theoretical side of quantum physics that has benefited from Wheeler's idea. Zeilinger is primarily an experimentalist and says Wheeler's "it from bit" has had an influence in his and his colleagues' thinking about designing experiments. 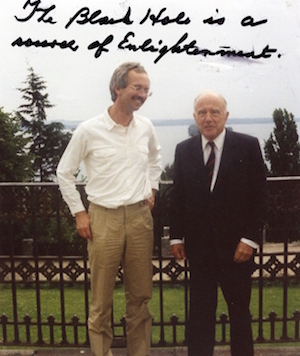 "He put out a great challenge for the development of quantum mechanics which is very important," says Zeilinger. "In some points his ideas might turn out to be too radical – it's too early to tell. But that's the process of science! In science it's necessary to have radical positions. And then when these positions are challenged, and we found out how far one can go, then that is progress. It's how science often operates." The most popular interpretation of the Quantum Enigma (Copenhagen) posits that a particle becomes "real" only when observed. This brings to mind a question that can be best expressed by an analogy to the macro world. During the War of 1812 the Battle of New Orleans was fought some time after a peace treaty had been signed. The combatants were unaware that the war had ended because of the communication delay. The war was simultaneously over and still in progress. The question this poses to quantum theory is would a particle that has been observed (waveform collapsed) appear real to a subsequent observer? Like shakeing a dice in a jar..
...and wondering why it doesn't show a number before stopping the dice. I think it's time for physics to face the fact, that some characterisics doesn't exist all the time. But I won't go so far to say there is no reality beyond that, because the dice exists. I have been trying to get a general idea of what can collapse the field into a defined reality for awhile now, I see a lot of information but most of it does not address my wonderings on the subject very well. I have wondered if a bug were placed as a detector (bug consciousness, yet consciousness) whether that is enough to collapse the wave to produce a two bar pattern in the double slit experiment and after reading this article, it appears possible, that any kind of measurement will do that. So, what are the implications of that? if Entropy = 1, is there anything at all ?, so out of nothing something comes ??? Fun craziness to play with on a snowy day .